Six out of every 10 Americans – 186.1 million people – live in areas where air pollution endangers lives, according to the 10th annual American Lung Association State of the Air report released today. Some of the biggest sources of air pollution – dirty power plants, dirty diesel engines and ocean-going vessels – also worsen global warming, the Lung Association says in State of the Air 2009. As America deals with the linked challenges of air pollution, global warming and energy, the Lung Association urges Congress, the U.S. EPA and individuals to choose solutions that help solve all three challenges together. Nearly every major American city is still burdened by air pollution, and the air in many cities became dirtier since last year, the report finds, despite “substantial progress” made against air pollution in many areas of the country and more attention paid to the environment by America’s growing green movement. State of the Air 2009 includes a national air quality report card that assigns A-F grades to communities across the country and details trends for 900 counties over the past decade. The report ranks cities and counties most affected by the three most widespread types of pollution – ozone, or smog; annual particle pollution; and 24-hour particle pollution levels. The report finds that air pollution hovers at unhealthy levels in almost every major city, threatening people’s ability to breathe and placing lives at risk. “The more we learn, the more urgent it becomes for us to take decisive action to make our air healthier,” said Nolan. Many cities, like Los Angeles, New York, Atlanta, Charlotte, Philadelphia, Washington, DC, and Baltimore have made improvements in their air quality over the past decade. Only one city, Fargo, North Dakota, ranked among the cleanest in all three air pollution categories. Seventeen cities appeared on two of the three lists of cleanest cities: Billings, Montana; Bismarck and Sioux Falls, North Dakota; Cheyenne, Wyoming; Colorado Springs, Ft. Collins, and Pueblo, Colorado; Farmington and Santa Fe-Espanola, New Mexico; Honolulu, Hawaii; Lincoln, Nebraska; Midland-Odessa, Texas; Port St. Lucie, Florida; Redding, Salinas, and San Luis Obispo, California; and Tucson, Arizona. The three cities most polluted by ozone are all in California – the Los Angeles-Long Beach-Riverside metropolitan area; Bakersfield, a center of agriculture, petroleum extraction and refining, and manufacturing in the San Joaquin Valley; and Visalia-Porterville, a San Joaquin Valley agricultural community. Pittsburgh-New Castle, Pennsylvania tops the list of cities most polluted by 24 hour fine particle pollution, while the three California cities that top the most polluted ozone list are close behind in this category and also for year-round particle pollution. In March 2008, the U.S. Environmental Protection Agency adopted a new, tighter standard for ozone pollution. The new standard showed that unhealthy ozone levels are more widespread and more severe than previously recognized. Evaluating the most recent data against the new standard, the American Lung Association found that approximately 175.4 million Americans – 58 percent – live in counties where ozone monitors recorded too many days with unhealthy ozone levels, far more than the 92.5 million identified in the State of the Air 2008 report. Sixteen cities making this year’s 25 most ozone-polluted list experienced worse smog problems than last year. The Lung Association’s review found consistent improvements in ozone in some cities, such as Los Angeles, with its long-standing ozone problem. But two cities, Dallas-Ft. Worth and Las Vegas, have higher ozone levels than 10 years ago. Ozone is the most widespread form of air pollution. When inhaled, ozone irritates the lungs, resulting in something like a bad sunburn. The health effects of breathing ozone pollution can be immediate. Ozone can cause wheezing, coughing and asthma attacks. Breathing ozone pollution can even shorten lives. In March 2008, the EPA adopted a standard of .075 parts per million, ppm, after legal action by the American Lung Association forced the agency to complete a formal review. This standard is not as strict as the standard of .060 ppm recommended by the Lung Association. The association, along with states, public health and environmental groups, has taken the EPA back to court in an attempt to force the agency to adopt the .060 ppm standard before its scheduled five-year review in 2013. State of the Air 2009 grades counties for both 24-hour and year-round levels of particle pollution – a toxic mix of microscopic soot, diesel exhaust, chemicals, metals and aerosols. One in six people in the United States lives in an area with unhealthy year-round levels of fine particle pollution (termed annual average levels). Nine cities in the list of the 25 most polluted by year-round particle pollution showed measurable improvement, including five cities that reported their best year-round levels since the Lung Association began tracking this pollutant: Pittsburgh, Cincinnati, Atlanta, York and Lancaster, Pennsylvania. The annual average level of particle pollution worsened in a dozen cities, including Bakersfield and Los Angeles, California and Houston, Texas. Roughly three in 10 Americans live in counties with unhealthful spikes of particle pollution which can last from hours to days (termed 24-hour levels). Thirteen cities had more days, or more severe days, of spikes than in last year’s report. Eleven cities have improved continually since the 2007 report. New data show that women in their 50’s may be particularly threatened by air pollution and that diesel truck drivers and dockworkers who are forced to breathe exhaust on the job may face a greater risk of developing lung cancer or chronic obstructive pulmonary disease. California researchers have tripled their estimate of the number of people that particle pollution kills each year in their state. In addition, Dr. Edelman suggests, people who live with particle pollution “must take action help us and other organizations to change the EPA regulations. It’s personal, it’s affecting them and their neighbors.” In addition, he said, they can take local political action to change regulations such as engine idling, and clean up diesel-powered school buses. Low income people and some racial and ethnic groups often face greater risk from pollutants. Pollution sources like factories and power plants may be closer to their homes, the Lung Association points out. Many live near areas with heavy highway traffic or have poor access to health care, which makes them even more vulnerable. Some racial and ethnic groups have a higher prevalence of diseases like asthma or diabetes, which compounds the ill effects of air pollution for these groups. Cleanest U.S. Cities for Ozone Air Pollution *Cities below had equal scores. Cleanest U.S. Cities for Short-term Particle Pollution (24 Hour PM2.5) *Cities below had equal scores. Visit www.lungusa.org to search local air quality grades by zip code. The government has revised its projection on traffic flow for the future Hong Kong-Macau-Zhuhai bridge, with estimates showing that 40 per cent more vehicles will use the link than previously forecast. Secretary for Transport and Housing Eva Cheng said a revision was made because the tolls could be kept low after the Bank of China offered a low interest rate on the 22 billion yuan (HK$25 billion) loan for construction of the bridge, thus reducing operating costs. Under the original projection, 9,200 to 14,000 vehicles would use the bridge per day in 2016, and the figure would gradually rise to 35,700 to 49,200 in 2035. Ms Cheng pledged to provide detailed revised figures to the Finance Committee’s public works body when it sought funding approval from lawmakers. The government would consider introducing short-term cross-border vehicle licences for drivers to use the bridge, the minister said. If a pilot scheme on short-term licences for the Western Corridor, which would be launched by the end of this year, was successful, similar permits might be used on the bridge. Legislator Lau Kong-wah, of the Democratic Alliance for the Betterment and Progress of Hong Kong, raised concerns about possible environmental pollution from mainland vehicles in the city, while the Democratic Party’s Lee Wing-tat said more cross-border permits should be issued to Hongkongers. The quota for vehicles travelling to the mainland would significantly exceed that for mainland vehicles coming to Hong Kong, Ms Cheng said in reply to Mr Lau’s concerns. Tolls for private cars and trucks would be HK$100 and HK$200, respectively. Construction of the bridge has been scheduled to start by the end of this year. The Bank of China will charge an interest rate 10 per cent lower than its benchmark lending rate, which is the lowest allowed by the state authorities, on the loan for the three governments to build the main section of the bridge. BEIJING (AFP) — Air pollution in China’s cities remains very serious, state media on Thursday quoted a minister as saying, amid an ongoing battle to clean up the skies in the world’s largest coal-consuming nation. “There is the potential for serious air pollution incidents to happen, and the air environment situation is extremely severe,” environmental protection minister Zhou Shengxian told parliament, the official People’s Daily said. “The difficulties in managing air pollution are intensifying, and environmental regulations as well as protection systems need to be further strengthened,” he said Wednesday. China is the world’s largest producer and consumer of coal and its appetite for the cheap fuel is growing as its economy expands, according to the Energy Bulletin, a website that monitors global energy supplies. In 2006, the World Bank said that 16 out of 20 of the world’s worst polluted cities were in China. A recent report by the state Xinhua news agency, citing a survey conducted in November last year in 320 cities, said the average air quality in two out of five Chinese cities ranged from “polluted” to “hazardous”. Zhou said car exhaust fumes also played a large role in air pollution in the country’s big and medium-sized cities, the report said. China’s worst air pollution was concentrated in the Yangtze River delta, which includes Shanghai, and the Pearl River delta — the manufacturing hub in the south of the country that is home to Guangzhou and Hong Kong. Air pollution in the capital Beijing, nearby Tianjin and surrounding Hebei province is also bad, he said. But Zhou said there had been improvement in some cities in China, without listing any specific locations. The China Daily reported at the start of the month that Beijing’s air quality was improving as a result of post-Olympics traffic control measures that had seen about 900,000 cars taken off the roads every weekday. The government will press ahead with plans for a sludge incinerator in Tuen Mun despite strong opposition from the district council and residents. About 80 residents holding banners and chanting slogans greeted Secretary for the Environment Edward Yau Tang-wah yesterday outside the Tuen Mun Government Offices, as he attended a district council meeting about the plan. “No sludge incinerator! Better planning for Tuen Mun!” they shouted as they submitted a letter to the minister voicing their discontent. Two motions were passed objecting to the project and calling for the government not to seek funds from the Legislative Council until it had committed itself to better planning for the district, which sees itself as a dumping ground for industries no one else wants. But Mr Yau said later the project was urgent and discussions with the council and residents could go on while the government pressed ahead with seeking funding of HK$4 billion. District councillor Chan Shu-ying said: “We expressed objection even when the government told us it planned to do an environmental assessment for the project. We will object to this sludge incinerator project. Another district councillor, Ho Hang-mui, accused the government of ignoring the views of residents and councillors on the project. “The government has no respect for Tuen Mun District Council at all. If the environmental assessment report says how pretty and harmless the facility will be then the government should build it in West Kowloon so that members of the public can see it and have access to its education and resources centre to learn about it,” Ms Ho said. Executive councillor Lau Wong-fat, the district council’s chairman, also called on the government to delay its plan to seek funds. “I really think the government should give us all more time to discuss it,” he said. “Does it have to be so urgent? More time is needed for talking to residents. When legislators learn that we object to the plan, that will not be good for the government.” The Environment Bureau will seek funding from Legco’s public works subcommittee and Finance Committee next month. Mr Yau said: “The government will continue to engage in talks with the district council about introducing better planning for Tuen Mun. The discussion can work at the same time with the administration seeking funds from the Legco. There is an urgency to build the facility, as the amount of sludge handled now is 800 tonnes and the amount will go up to 1,500 tonnes in 2014.” Mr Yau said the government would explain more about the project to ease the worries of councillors and residents. Environmental officials have claimed “huge” success in efforts to improve air quality in the Pearl River Delta, although they admit plummeting industrial production could have had something to do with it. They say that after completion of major sulfur-reduction projects in Guangdong and a switch to cleaner industrial and vehicle fuel, concentrations of sulfur dioxide in the air fell by a third in the six months to March compared with a year earlier. The drop was in line with a general improvement in air quality in the region as reported in the latest regional air quality monitoring results for last year, released yesterday. The results showed that the annual average concentration for sulfur dioxide, a major pollutant from fuel combustion, dropped by 19 per cent compared with 2007, while the particulate matter level fell 11 per cent. The levels of two other pollutants, nitrogen dioxide and ozone, however, remained largely the same as in the previous year. It was the third report on the region’s air quality since a cross-border monitoring network, with 16 stations in Guangdong and Hong Kong, came into operation in late 2005. The network provides the regional air quality monitoring index daily on the websites of the Environmental Protection Department and Guangdong Environmental Protection Bureau. The report showed that the proportion of days with the worst air quality dropped from 10.5 per cent in 2007 to 7.5 per cent last year, while good air quality days increased to 71 per cent, from 66 per cent in 2007. Pollution also reduced significantly in individual areas, particularly in the black-spot cities of Foshan and Zhaoqing . 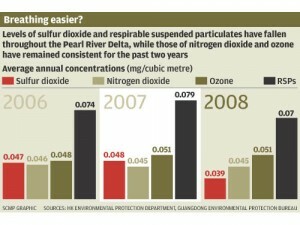 Despite the improvement, a Hong Kong environmental official was cautious about saying last year represented a watershed in the battle to reverse the trend of worsening air quality in the delta. “We need more monitoring data, say, for five years, to ascertain that,” he said. The official attributed the change to the completion of desulfurisation projects at major power plants in Guangdong. Coal-fired plants with a total capacity of 26,000MW were fitted with sulfur scrubbers last year, more than double the capacity in late 2007. Smaller polluting generation units with a total capacity of 3,600MW have been closed down. The official said upgrading vehicle fuel with less sulfur in Guangdong and using ultra-low-sulfur fuel for industries in Hong Kong also added to the progress. Sulfur dioxide and particulate levels in Hong Kong fell by 7 and 5 per cent last year, though the ozone level rose by 5 per cent, he said. The sky has also cleared somewhat, with the number of hours with poor visibility falling to 1,100 last year, from nearly 1,300 hours in 2007, the Observatory has reported. California became the first state in the nation Thursday to mandate carbon-based reductions in transportation fuels in an attempt to cut the state’s overall greenhouse gas emissions. The California Air Resources Board approved a phased-in reduction starting in 2011, with a goal of shrinking carbon impacts 10 percent by 2020. Fuel producers can comply in different ways, such as providing a cleaner fuel portfolio, blending low-carbon ethanol with gasoline or purchasing credits from other clean-energy producers. California‘s low-carbon fuel standard could lead to a national measure under President Barack Obama, as well as shape how the transportation sector evolves. But businesses and oil industry critics warned that more research is necessary and that its action would lead to higher costs for consumers in a recessionary economy. Board Chairwoman Mary Nichols hailed the low-carbon fuel standard as a major step in moving the nation away from oil dependence and toward alternative fuels that generate lower greenhouse gas emissions. “By changing the way we think about fuels and requiring them all to be lower carbon, I think we are now finally creating an opportunity for other types of advanced transportation to compete on a level playing field,” Nichols said. California Gov. Arnold Schwarzenegger asked the air board in 2007 to consider a low-carbon fuel standard as way to meet the state’s overall goal of cutting greenhouse gases 25 percent by 2020, as mandated by a 2006 law. The air board looked at the entire carbon “intensity” of fuels, rather than the impact of emissions from use alone. That meant considering the emissions from the start of production to lasting impacts not directly related to fuel supply. That led to some controversy over the air board’s regulations dealing with corn-based ethanol producers. A staff analysis assigned additional greenhouse-gas consequences to their fuels alone based on the potential impacts that ethanol production has on forests and green space. The theory is that increased ethanol production reduces the existing amount of farmland for food crops, which in turn leads to cultivation of untouched land that previously captured carbon. Ethanol advocates challenged the report’s findings, disputing that their corn-based production had a significant impact on greenhouse-gas increases elsewhere. But they also suggested that petroleum and other fuels were not given the same treatment. Gen. Wesley Clark, a former Democratic presidential candidate, testified on behalf of Growth Energy, an ethanol advocacy group. He said that greenhouse-gas emissions related to the U.S. military in the Middle East should be considered as part of oil’s calculation. The air board promised to work with ethanol producers to update formulas related to the indirect effects of fuels as warranted by future research. But it stood by its findings that other fuels did not have significant indirect impacts. Environmentalists and health organizations praised the low-carbon fuel standard as a significant step toward shrinking the state’s carbon footprint and providing cleaner air for residents. Roland Hwang, transportation program director for the National Resources Defense Council, said the ethanol regulation is appropriate because it will force ethanol producers to seek cleaner and more sustainable forms of fuel production. But oil producers said too many uncertainties surrounded the new regulation and could lead to unintended consequences, such as supply problems. Small business groups also testified in opposition Thursday, some noting that California could hurt its businesses by forcing them to pay higher costs to comply. Two years after a Supreme Court decision ordering the EPA to decide how to approach greenhouse gas emissions under the Clean Air Act, the Agency has finally issued proposed findings that the gasses endanger public health, and that emissions from automobiles contribute to this form of pollution. In a decision that was two years in the making, the Environmental Protection Agency announced Friday that it had reached preliminary findings that six greenhouse gasses endangered public welfare and that motor vehicles contribute to the environmental levels of four of these. The decision was required by the Clean Air Act, as determined by the US Supreme Court, but the Agency responded to the Bush-era decision with an extended period of inaction. The EPA is soliciting public feedback for the next 60 days, and will hold two public hearings before finalizing the decision. The EPA declined to do so on procedural grounds, providing a variety of arguments that it claimed obviated any need for its action. For example, one of its justifications was that automotive greenhouse gas emissions are proportional to fuel efficiency, which is regulated by the Department of Transportation. This, in the EPA’s view, meant that it was off the hook when it came to regulating emissions. That suit was ultimately joined by several states (and opposed by others); appeals eventually brought it before the Supreme Court. The Court reached a decision just over two years ago, finding that greenhouse gasses clearly fit the Clean Air Act’s definition of pollutants, meaning that the EPA was compelled to either regulate them or explain why they weren’t actually in need of regulation. That decision was released just over two years ago. It put the Bush administration in an awkward place. At the time, its policy as enunciated by Interior Secretary Dirk Kempthorne, was that existing regulatory statues were inappropriate for application to greenhouse gasses (Kempthorne specifically mentioned both the Clean Air and Endangered Species Acts). Instead, the Administration wanted to see separate legislation passed to manage them separately, although (or, more likely, because) passage of any legislation of the sort was considered extremely unlikely. At the time, we suggested that the EPA would declare its intention to respond to the decision by formulating rules using a process that would not be complete before Bush left office. Others suggested it find new statutory reasons to shirk this responsibility—current EPA administrator Lisa Jackson, in announcing this decision, noted that this advice was never accompanied by any indication of whether any such statutory reason actually existed. In the end, the Bush-era EPA simply did nothing. Although press reports indicated that the Agency’s science staff prepared a statement that declared greenhouse gasses to be pollutants under the Clean Air Act, the EPA never acted on it, or showed any indication it would respond to the Supreme Court’s decision. The newly released draft findings are basically a bow to both the Supreme Court and the government’s own Climate Change Science Program. In the document, the EPA identifies six key anthropogenic greenhouse gasses: carbon dioxide, methane, nitrous oxide, hydrofluorocarbons, perfluorocarbons, and sulfur hexafluoride. It lists a host of environmental and health impacts associated with greenhouse forcing of the climate, such as rising sea levels, changes in precipitation patterns and associated water shortages, extensive tree die-offs and forest fires, extended heatwaves, and intense precipitation events. For anyone who doesn’t buy the scientific community’s general agreement that greenhouse gasses can force the climate, the document mentions the ocean acidification caused by increases in atmospheric carbon dioxide. With the endangerment finding out of the way, the EPA moved on to the “cause and contribute” finding, recognizing that emissions from the US’ transportation sources are a major contributor of anthropogenic greenhouse gasses. In fact, the proposed findings note, the US transportation sector alone would place fifth on the global emissions list, after the rest of the US, China, Russia, and India. The proposed findings do not include any regulatory decisions; instead, they simply bring the EPA into compliance with the Supreme Court decision and establish a baseline from which regulatory decisions can be made. Chances are good that someone is going to sue over these findings, as well as any rules that do eventually emerge. Instead, these findings are likely to provide a spur to what the Bush administration claimed it always wanted: a distinct legislative framework for regulating greenhouse gasses. A number of bills that would provide this framework have been introduced to Congress, but progress has been slow and they face significant opposition. If there is one thing that’s likely to spur Congressional action on this matter, it’s the threat that the decision might be taken out of its hands. The world’s shipping lines are under international pressure to help protect the oceans from pollution. Zim Container Line is one of several major carriers that is taking the challenge seriously. Zim, a customer at the Port of Halifax since 1972, bought one of its newest vessels into Halifax on Wednesday as part of the inauguration of its service from Asia to the Mediterranean. Zim San Francisco, a Panamax container ship with a capacity of slightly under 5,000 TEUs (20-foot equivalent units) and only two months out of the Daewoo Shipyard in South Korea, leaves little evidence of pollution in its wake. “Our company sets environmental standards,” the ship’s chief officer, Timo Kopf, 28, said Wednesday. The ship, owned by the CONTI Group of Germany and chartered by Zim, has an incinerator on board and what garbage can’t be burned, like tin cans, is bagged and discharged when the vessel reaches port. The ship also has a bilge water separator that separates any waste oil from waste water that might be discharged into the ocean. “We also have sludge tanks and discharge that material to contracted companies when we get to port,” he said. Chief Officer Kopf said Zim follows international standards and has its own environmental targets for food waste disposal. Zim San Francisco is one of 15 vessels in the Asia-Mediterranean service that calls at Halterm container terminal twice a week. The port rotation is Skekou, China; Hong Kong; Ningbo, China; Shanghai; Pusan, South Korea; Balboa, Spain; Panama Canal, Kingston, Jamaica; Savannah, Ga.; New York; Halifax; Tarragona, Spain; and Haifa, Israel. The German-flagged vessel, with a crew of 21, burns about 110 tonnes of fuel a day at minimum speed and up to 115 tonnes at maximum speed. The ship can stay at sea for more than three weeks before refuelling. The government will organise seminars for local professionals in environmental services this month, to help them explore emerging markets locally and across the border, Environment Secretary Edward Yau Tang-wah said. Mr Yau said the Closer Economic Partnership Arrangement had enabled such servicing companies to own and operate businesses on the mainland. That would increase their chances of tapping the growing demand for environmental services amid the economic transformation in Guangdong province. Chief Executive Donald Tsang Yam-kuen announced plans last week to further explore business opportunities for the environment industry, among others, in the global financial crisis. Mr Yau said some of the sector’s professionals might be ready to pursue their advantages; but others might need to adjust their operations, or join forces, to tap the opportunities. The HK$450 million matching-fund scheme for energy and carbon audits and improvement works for local buildings, to be launched today, would be an opportunity for such firms to find business locally, he said. Across the border, Mr Yau said, the market was also growing gradually, after the introduction of the HK$93 million clean-production scheme. So far, 160 companies have participated in the programme. The scheme’s success has encouraged Guangdong provincial and local authorities to roll out similar incentive programmes, which would increase the demand for environmental services. Exposure to traffic pollution could affect the development of babies in the womb, US researchers have warned. They found the higher a mother’s level of exposure in early and late pregnancy, the more likely it was that the baby would not grow properly. UK experts said much more detailed research into a link was needed. The researchers, from the University of Medicine and Dentistry in New Jersey, used information from birth certificates and hospital discharge records. They recorded details including each mother’s ethnicity, marital status, education, whether or not she was a smoker – as well as where she lived when her baby was born. Daily readings of air pollution from monitoring points around the state of New Jersey were taken from the US Environmental Protection Agency. The scientists then took data from the monitoring point which was within six miles (10 km) of the mothers’ homes to work out what their exposure to air pollution had been during each of the three trimesters of pregnancy. It was found that mothers of small, and very small, birth weight babies were more likely to be younger, less well educated, of African-American ethnicity, smokers, poorer, and single parents than mothers with normal birth weight babies. But, even after these factors had been taken into account, higher levels of air pollutants were linked to restricted foetal growth. Two kinds of pollution produced by cars – tiny sooty particles and nitrogen dioxide – were found to have an impact. Particulate matter is produced from vehicle exhausts and can lodge in the lungs. Fine particles, such as PM 2.5s, which penetrate deep into the lungs, have been linked to deaths from heart and respiratory diseases. The risk of a small birth weight baby rose significantly with each increase in particulate matter of four micrograms per metres squared, during the first and third trimesters of pregnancy. Similarly, the risk of a very small birth weight baby rose significantly with each 10 parts per billion increase in nitrogen dioxide. They say it is not clear exactly how air pollution might restrict foetal growth. But they add previous research suggests that air pollution might alter cell activity, or cut the amount of oxygen and nutrients a baby receives while in the womb. Professor Patrick O’Brien, of the UK’s Royal College of Obstetricians and Gynaecologists, said: “This is an interesting study because it flags up a possibility of a link. “But I think it needs to be looked at again in more detail because of the probability of confounding factors. Professor O’Brien added that future research into the effects of pollution should be careful to check if babies are born small because their parents are small, and to ensure pregnancies are dated from scans, where this study did neither.